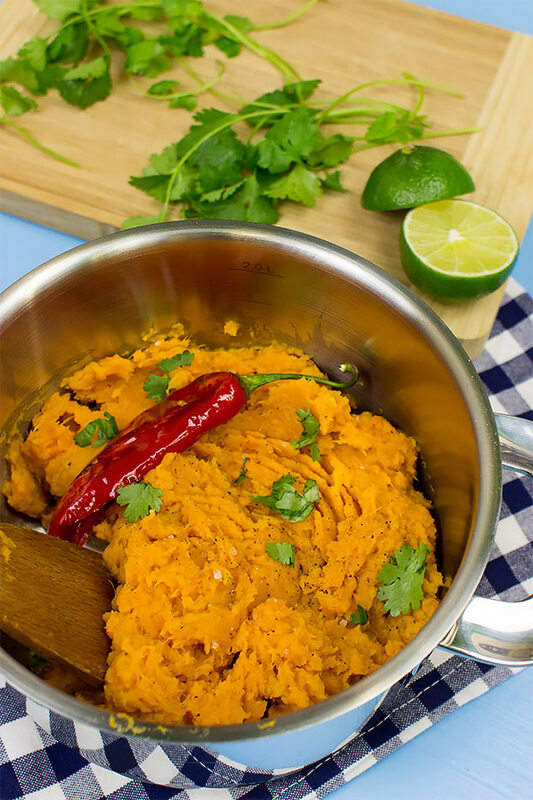 This healthy sweet potato mash recipe was one born out of pure frustration. After looking around online almost every ‘healthy’ mashed sweet potato dish was most definitely not; they’re all covered in cream, slathered in butter or drowned in milk. Or if they avoid dairy then they’re stocked in sugar or coated in syrup. Tasty, sure, but I mean seriously, wtf? 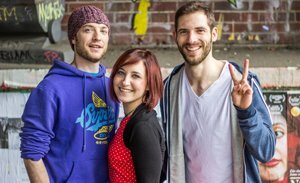 Taste doesn’t have to rely on sugar, nor should health be about dairy products. Sweet potatoes are a nutrient bomb all on their own – they just need a little of the ‘good fat’ to unlock their true potential. Sweet potatoes are incredibly nutrient dense – a single sweet potato will provide the body with about 400% of its vitamin A needs (by absorbing the beta-carotene in the potato and then converting it). It also includes plenty of vitamin C, B6 and potassium, as well as smaller amounts of calcium, iron, magnesium and vitamin E, to name a few. 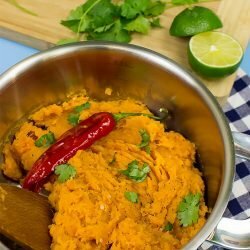 I don’t want to talk about the nutritional benefits of this healthy sweet potato mash tooooooo much (these guys do a very thorough job right here) but some of the pros of a sweet potato really should be mentioned. Not only does the fiber in them help out in many ways, even though they’re considered a starchy vegetable, it seems they actually do more for the blood-sugar level than against it. That, combined with stabilising blood pressure and anti-inflammatory effects means that sweet potatoes really deserves a place on any table. And the best news? All that lovely beta-carotene needs just a little help to be absorbed. And olive oil will do exactly that. Forget the heavy creams and sloppy butters, we’re going to show you the way to really eat these delicious sweet potatoes. Olive oil, though tasty on its own, gets even better when gently infused with ginger and garlic. And it’s so easy to do! While the sweet potatoes are boiling away, simply peel and roughly chop a couple of garlic cloves and a thumb of ginger. Take one red chilli pepper and slice it down one side. Add these to a small frying pan, along with olive oil and let it cook slowly for a few minutes. When the potato is soft and ready to be mashed, take the oil from the heat and spoon away the chilli, garlic and ginger. Mix the oil with the potatoes and you’ve got a soft, warm mash emanating with a gentle taste of ginger and just a subtle hint of heat from the chilli. And the best best news? You can take this mashed sweet potato to exactly the level you want. Don’t want the chilli heat? Just leave the chilli out. Want a bit more spice? Make four incisions down the chilli instead of one – it’ll release more heat. Want an absolute burst of flavour? Chop the ginger, garlic and chilli pepper into tiny pieces before putting them in the oil – then mix them all into the mash at the end. Wow, just wow. So there you have it. 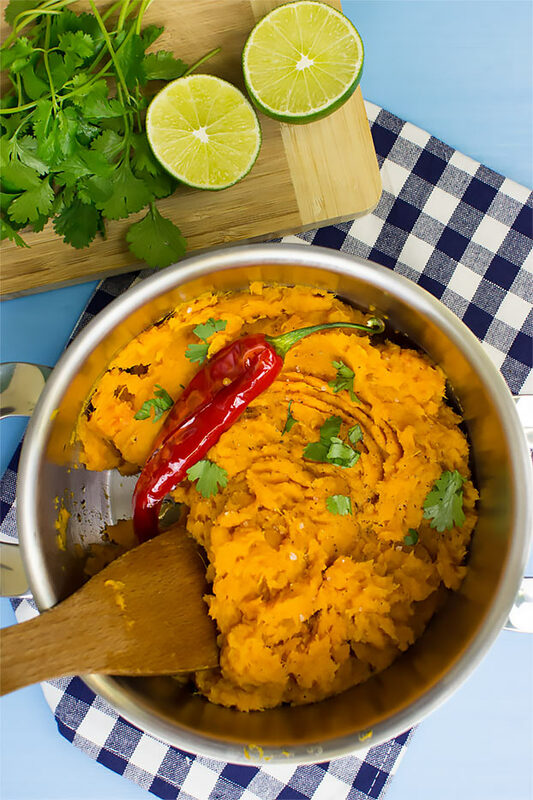 One seriously healthy sweet potato mash recipe – made just right for you. Sweet potatoes are incredibly healthy – they just need to be done right. And we know exactly how. 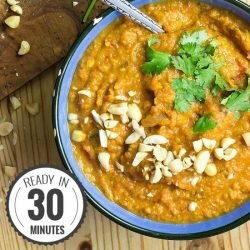 Vegan-friendly, quick and with an amazing infusion of flavour. 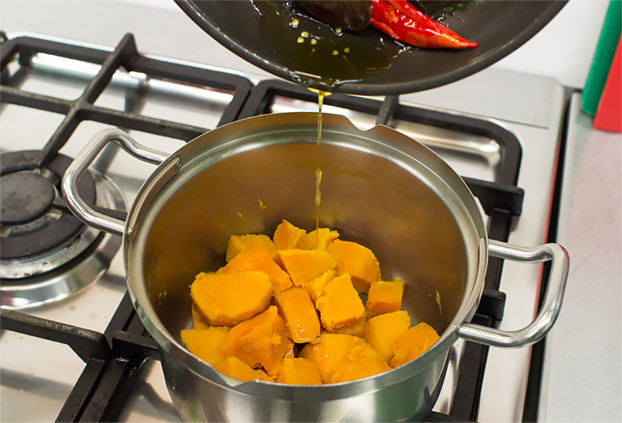 Peel and chop the sweet potatoes, add to boiling and slightly salted water in a large pan. 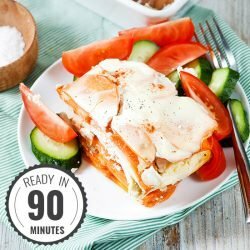 I usually go for cubes about 3cm x 3cm and they need no more than 15-20 minutes to cook. While they're cooking add the olive oil to a small frying pan on a low heat. Peel the garlic and chop the cloves in half. Peel the ginger and chop into rough pieces (they don't need to be tiny, you're going to remove them again soon). When the potatoes are soft (poke them with a knife to check) drain them, then put them back in the pan (not on the heat). 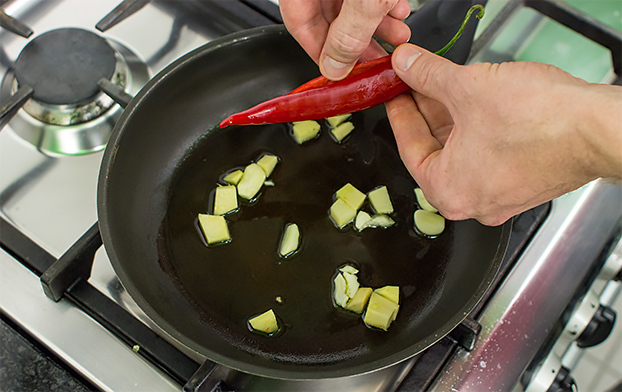 Use a spoon to remove the ginger, garlic and chilli from the oil, then pour the oil into the potatoes – mash it all together! Serve with a little lime juice sprinkled over the top and some coriander (well, if you like coriander, that is!). *if you want it REALLY spicy, then chop the ginger, garlic and chilli pepper into tiny pieces before they go into the oil. When the potatoes are ready, simply throw the oil and all the tiny pieces into the potatoes, and mash it all together. This version is MUCH stronger in flavour. 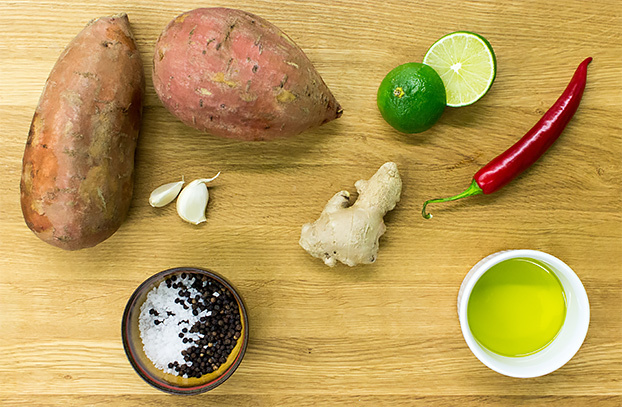 Need more sweet potato goodness? 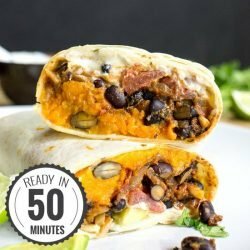 What about sweet potato burritos? So good! Or sweet potatoes with a pistachio sauce? That one’s a keeper for any recipe lover! Healthy Sweet Potato Casserole - Hungarian-style!